Now that my kids are 5 and 7 and can read time on a digital clock, we make an agreement ahead of time about what they can start asking ‘are we there yet’. Then I have a basket of goodies in a no-man’s land between the two of them on the back seat. It’s filled with books, and games and music etc. Then I have a stash of extra things to add to the box over the day (or week! if it’s a long road trip!) to keep it fresh. Healthy (not sticky snacks) are also a life saver, e.g., carrot sticks or popcorn. We do a LOT of road trips. LOL. Signing with kids is a great way to “buy time” or “kill time” however you like to look at it! Whether it be by teaching new signs – especially VEHICLE signs for a road trip! Then there is also the Hullabaloo Road trip CD that is awesome. So this year I’m going to do my best to get my act straight and prepare all this stuff before we leave (and hunt down that Hullaballoo album). Now that I’ve got one road trip under my belt, I know how my kids are going to behave (or should I say, “not behave”) after a few hours of sitting in the car. If you plan on visiting a few National Parks, consider the National Parks Pass. A National Parks Pass is $80 and is good for one full year up to the end of the month that you purchase it. The pass can also be used by several other agencies such as some federal recreation sites and national forests. Bring simple food staples and buy local. Bread and tortillas go a long way. So do deli meat, cheese and PB&J. It was nice to be able to stop on the side of the road at a National Park to whip up some peanut butter and jelly sandwiches and enjoy our lunch while overlooking Crater Lake. We also hit up some fruit stands to get a taste of the local produce. Cherries from Washington sure taste a lot better than cherries from CA! Just remember, some fruits can’t be transported across state lines. Even if you don’t have a baby, baby wipes are a must! From quickly cleaning grubby hands before eating to wiping down a sticky picnic table, the wipes sure come in handy! Store your travel memories in a SMASH*® Book . You can write about your travels on the pages and “smash” stuff in. I put maps, brochures, and even made pop up pictures. The kids looked forward to contributing to the book whether it be finding a feather or making a drawing. Plus it limits the amount of rocks and “stuff” that the kids would usually collect. A little screen time helps. Yeah, yeah, I know — the kids are supposed to enjoy the scenery while on the road. But when it leads to whining and fighting, a little distraction keeps parents sane. Our friend let us borrow her dual-screen DVD player for the trip — which helped a lot. We mostly allowed the DVD during less-scenic stretches of highway and it saved a lot of whining. There are Costco gas stations (almost) everywhere. If you are a member, this is a great way to save money on gas! Freshen up your first aid kit. We weren’t diligent about keeping our first aid kit “fresh.” When my husband sprained his ankle, I tried activating a cold pack and it just didn’t work. The ice pack had expired 2003… so did all the medicine in it! Go Geocaching! I’ve been geocaching for a few years now. Geocaching in a new environment helps you discover places that you would otherwise overlook. Even though I didn’t do as much geocaching as I would have liked on our last road trip, I used my geocaching app to read descriptions and the history of our location. Crayons might be a bad idea in the summer. With cars getting hot in the summer, you might want to rethink bringing crayons in the car for your kids’ entertainment. It’s no fun finding melted wax on the carpet of your car or wedged in the upholstery of the back seats after you’ve left the car to go on an outing. Not to mention the washable kinds melt a lot faster than your regular crayons. Go for colored pencils instead. You won’t have to worry about searching for marker caps or finding stained blankets from an open marker sitting on top of it. Make new friends. We ran into a young couple from a small town in south eastern British Columbia, Canada while making our way home. It turns out that they were headed toward San Diego, too! We exchanged information and told them to call us when they got into town… and they did! We were able to give them a little taste (literally) of our hometown. We were able to “pay forward” the generosity that our friends and family have shown us as strangers in their town. Our hope is to one day visit them! I will be posting about our West Coast Road Trip soon (with a peek at my SMASH book)! So stay tuned! 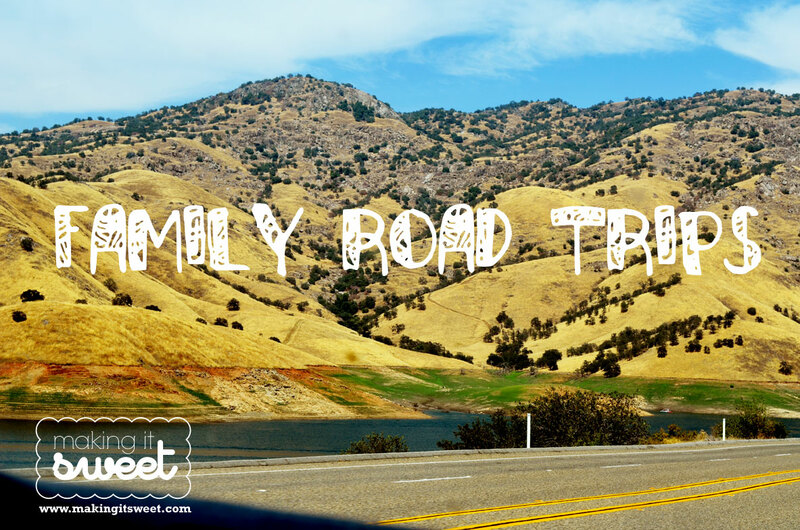 What great tips do you have for road trips? Post them in the comments below!